Skye Gravestones | Malcolm & Mary (Macdonald) Matheson. Malcolm & Mary (Macdonald) Matheson. 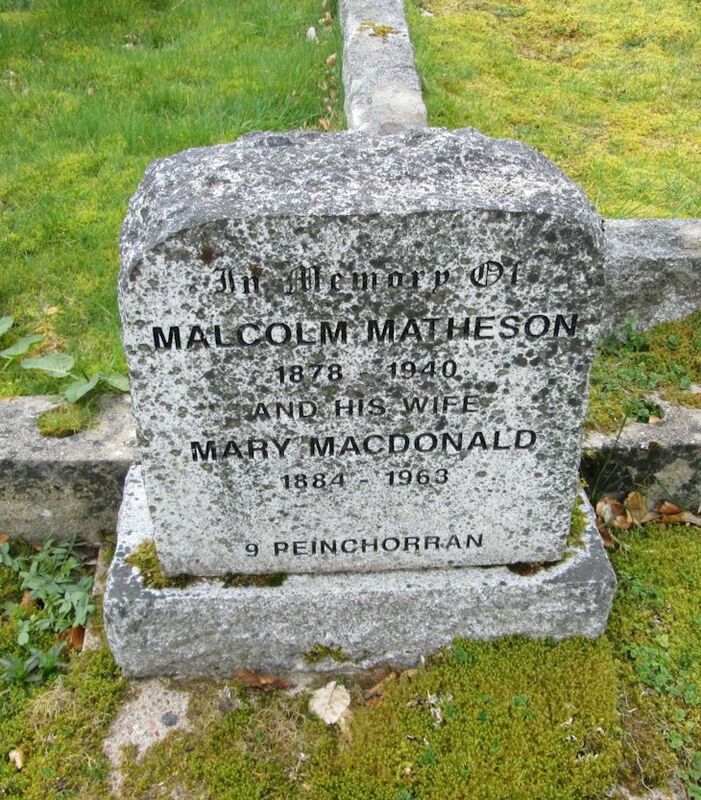 In memory of/MALCOLM MATHESON/1878-1940/and his wife/MARY MACDONALD/1884-1963. 9 Penchorran. Malcolm is son of James Matheson (image 1362) His wife Mary lived at 14 Fraser Crescent Portree in her later years. Their children were Mary (Goode) 1918-1995: James 1920-2003: Jane (Barclay) 1923-1995 Dolina (Ross) 1924-2003: Flora (MacCallum/Fenton) 1927-2002. Added by Duncan MacCallum on 19 March 2018.